Definitely getting chillier! The potting shed heater has had its first use of the season, essential kit when sowing seeds and taking cuttings at this time of year. I have had a couple of light frosts so far, enough to cause the dahlias to surrender, I think I’ll be digging them up this weekend, maybe next week. Anyhow, time for another Six on Saturday. Six things, in the garden, on a Saturday. Could be anything – a job to do, a job completed, an interesting plant, a bug, a bird, a flower, anything at all. Join in! 1. Begonia leaves. The frost has got this, it is on its way out. 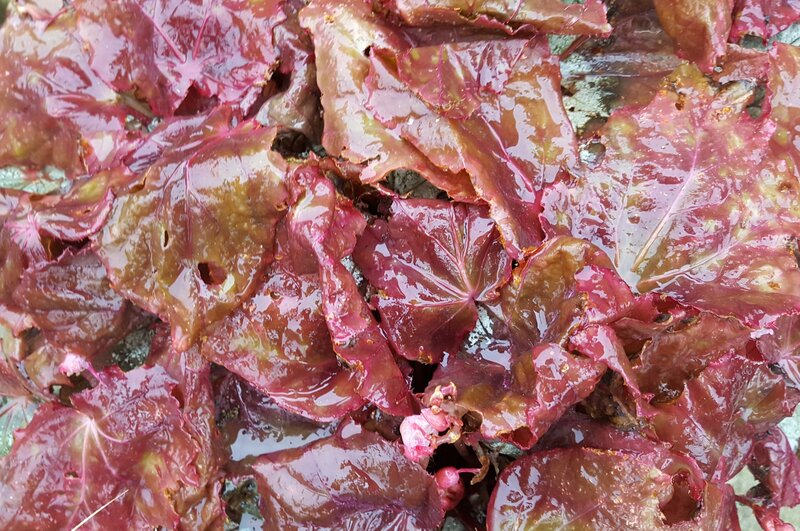 The leaves were silvery with hints of red, they are now a much more crinkly red. I might try to overwinter it, see if it comes back next year. Or I might not. 2. The Dead Zone, under the trampoline. Nothing grows here, unsurprisingly. To call it a storage area would be overly grand, it’s really a bit of a dump where I “temporarily” chuck stuff in passing. Pot trays, buckets, trug, pots, bits of old crap I haven’t got around to taking to the tip. About twice a year I clear it out, sort of, but stuff soon accumulates. I am not proud. 3. Dogwood. Your basic red stemmed, variegated variety. Cornus mas alba, I think. The leaves are almost all off now, the red stems beginning to show through. Also showing through is the pesky jasmine, one of my resident thugs, which attempts to grow through everything along Borders 4 and 5. I will soon be doing battle with it. 4. Windfall apples. Next door’s apple tree has been particularly bountious this year, my telescopic apple picker has been well used, but we are all appled out. There is only so much chutney, crumble, stewed apple etc etc that we can be bothered to make. These, along with the many littering the gaff, will go on the compost heap. 5. Tulip planting. It’s my own fault. Like the proverbial kid in a sweet shop, I have gorged myself to the point of nausea. I have planted maybe half of the tulips. I have added daffodils to the bottom layer of some of the larger pots, and have usually included a mix of two (hopefully) complimentary tulip varities. The smaller pots just have one variety. 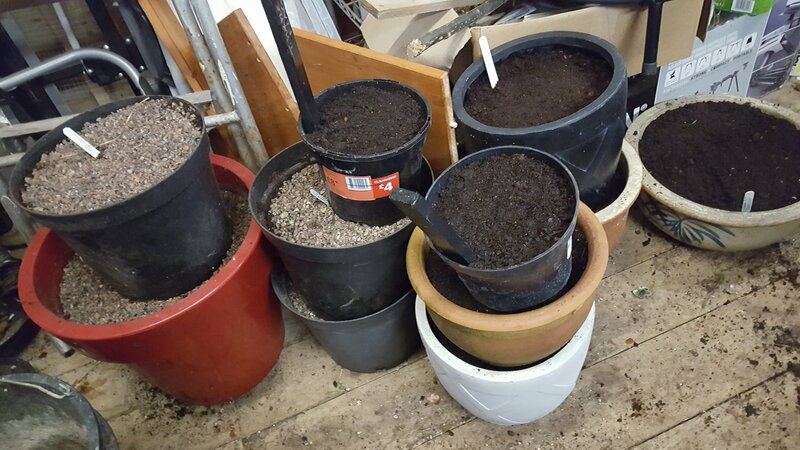 I have now almost run out of patio containers, so I will be planting the rest in 3L plastic pots and burying them in the borders. Should provide a nice blast of colour in the spring. I might have accidentally bought even more bulbs this week. 6. 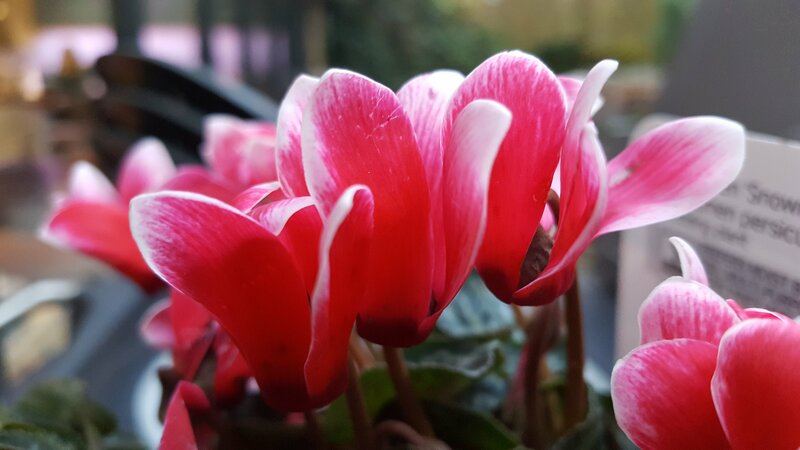 Cyclamen. Having found a cyclamen lurking in the garden a couple of weeks back, I spotted this one in B&Q the other day. Not sure if it will survive the winter, or even where I’ll plant it, but I like it. That’s my Six for this week, what are yours? Join in! Dead easy, write your post, add a comment here with a link to your post, and maybe add a link back to here in yours. For more details please see the brief participants’ guide. Have a great weekend, don’t forget to check back in as more Six posts are added. I’ll be back next weekend with another Six on Saturday. Avoid compelling offers. £1.79 for 50 bulbs in my case. Allium drumsticks. I got 100…. Oh, I see. Yes, it can be hard to pass up a bargain. I’ll get this one day! Is there a simpler way of writing the address? If i need to get a lo k for one of my posts I look at my published post, then use the ‘share’ feature in WordPress. One of the options in the share feature is to copy to clipboard. You can then paste the link wherever you want. I try so hard not too have a dumping ground in my garden but it seems to be impossible so far. Well hello. Not very heavy. -3°c maybe? I am so sick of tulips. Bulbs in general. It had better be worth it. I wonder what I’ll find for next week! Busy Saturday here, so hope to return to read the other Sixes tonight or tomorrow. 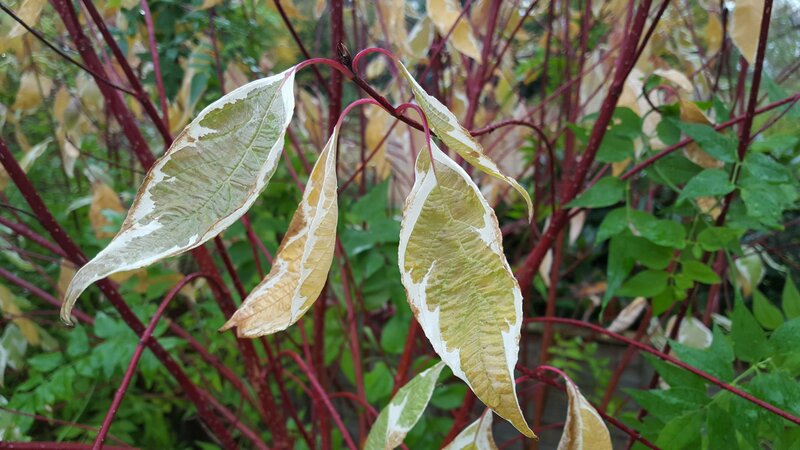 Your cornus are so vibrant! Lovely variety. There’s a great beautiful swath of them in the park where I take Big Nose, but I prefer yours, to be honest. I’m also surprised folk still have apples. Obviously I’m quite ignorant about the fruit & have drawn my conclusion on our ancient tree. 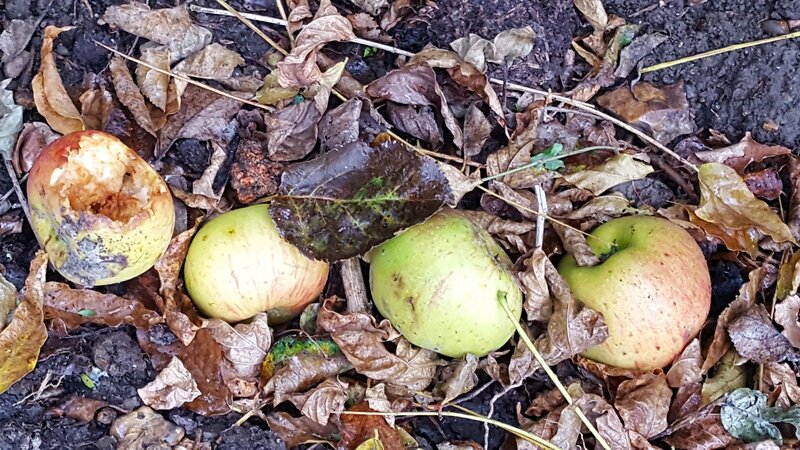 None of us are big apple fans, so the wildlife here had a feast earlier in the autumn. And once again, I’m having cyclamen envy. Next year . . . next year. So here’s my humble six. A hard prune is the secret to bright dogwood stems, the found wood is much redder. Next year, carrier bags of apples, leave outside, someone will take em. Bit of guerrilla pruning! For full stealth mode, just prune every 3rd stem each year. They never notice! There’s not a thing in your dead zone that I haven’t got in mine, trays, pots, bags, bits of hose. And with bulbs in pots I’m detecting a familiar propensity for avoiding deciding where to put something by growing it in a pot “for now”. We have pots of bulbs ten years old and still waiting. ‘In a pot for now’ is a very familiar phrase. I got fed up watering all the pots and when we moved I decided no more pots! Well, except the agapanthus, cordyline, yucca. rose, herbs…..
You should see the shed. It’s a shocker. Love your 6 on Saturday posts, thanks. Re the tulips in pots buried in the borders do you dig a hole for the pot and then take the whole thing back out after tulips finished their thing o just place them in the borders? Thanks Lyn! Exactly, dig a hole bury the pot then lift when flowering is done. I plan to hide the pots somewhere while the foliage dies it’s slow but necessary death. Time will tell if i can actually be bothered…! Lol like John said we all need an area to store things that may come in handy sometime in the future, love cornus and cyclamen, don’t grow enough off either of them, bet you will be glad to see the end of the bulb planting as well! So sick of bulbs. But still have strange compulsion to buy more. 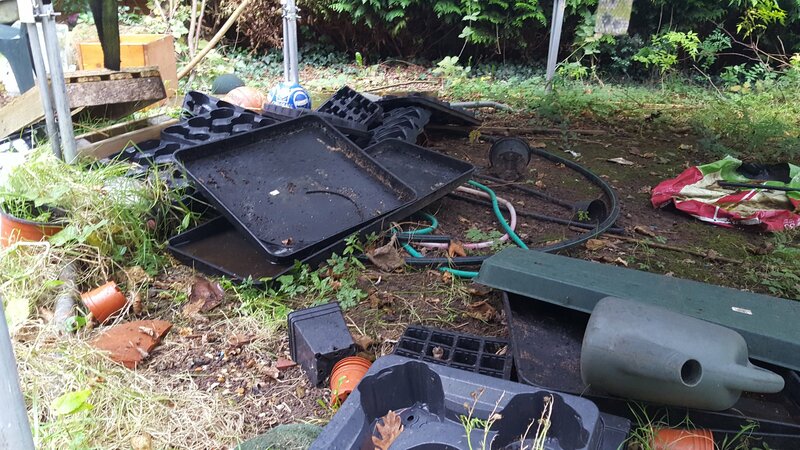 Every garden needs a dumping area, don’t worry about your constructive use of otherwise wasted ground. Will Cyclamen be this months Iris foetidissima I wonder? My six, a bit original today, are over at https://rivendellgarden.blog/?p=2688. It may take a while for me to get over seeing you naked.